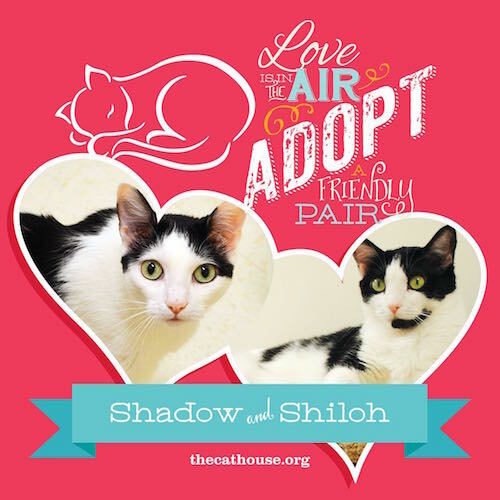 Shadow and Shiloh are an imaginative pair of cats who will keep you entertained for hours. They were born in mid-2011, but you’d think they are still young kittens a lot of the time – they have a lot of energy. Shadow, a male cat, and Shiloh, a female, came to us when their owner passed away. During February 2015, adopt both for the regular adoption fee of just one. Apply to adopt here. SHADOW AND SHILOH HAVE BEEN ADOPTED! 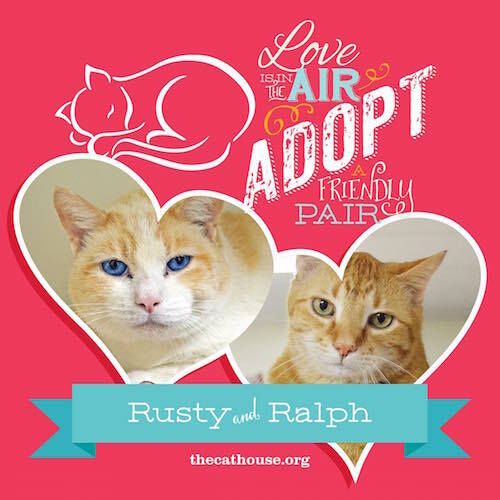 Rusty and Ralph had lived together for years when their person had to move to a hospital and was unable to care for them. Ralph, the red tabby, is a Manx and was born in 2005; he loves to cuddle and to be carried around. Rusty, the lighter red tabby and white with AMAZING blue eyes, is a little more cautious about new people, but once he gets to know you, he will follow you around, asking to be petted. During February 2015, adopt both for the regular adoption fee of just one. Apply to adopt here. Mamie and Tigger started their lives in 2011 as feral (wild) kittens . After a while, they decided the indoor life, with food, water, shelter, cuddling, and toys provided, was more to their taste. Tigger especially enjoys laps, while Mamie prefers to share chairs with Tigger only (but you’re welcome to give her plenty of petting!) During February 2015, adopt both for the regular adoption fee of just one. Apply to adopt here. 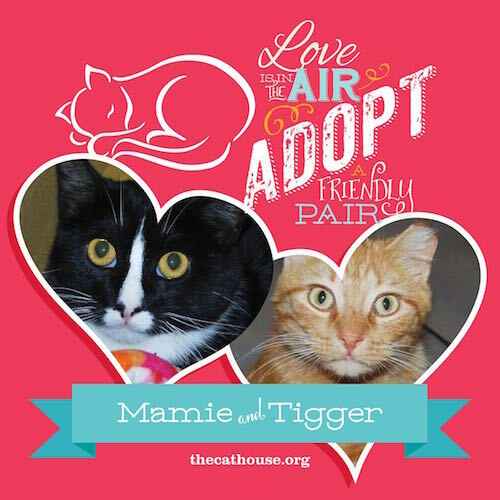 MAMIE AND TIGGER HAVE BEEN ADOPTED! 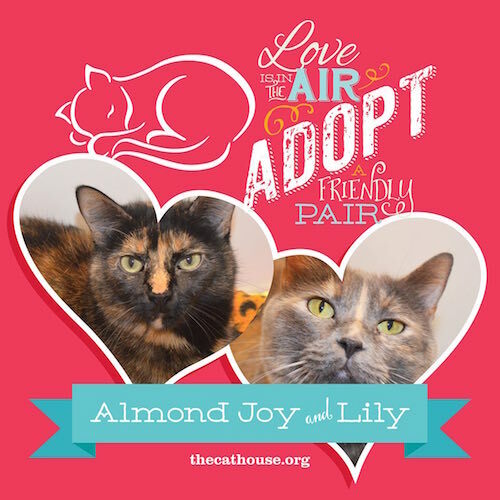 Have you met Almond Joy and Lily? These sweet ladies, sisters born in fall 2008, will make you forget all about the freezing temps when they snuggle up on your lap. During February 2015, adopt both for the regular adoption fee of just one. Apply to adopt here. ALMOND JOY AND LILY HAVE BEEN ADOPTED! Little Kohl was found at a department store in Lincoln (guess which one!). He was not even two months old at the time, was dirty, thin, and had been injured, probably by an adult cat. He was one lucky kitten to have been found by a kind person who got him to The Cat House. Kohl, whose birthday is estimated to be around October 1, 2014, is healthy now and ready to be adopted. He’s a playful little guy who would like to go to a home with another kitten or young cats who would enjoy running around the house at top speed, chasing toy mice, and then cuddling. You can apply to adopt Kohl here.